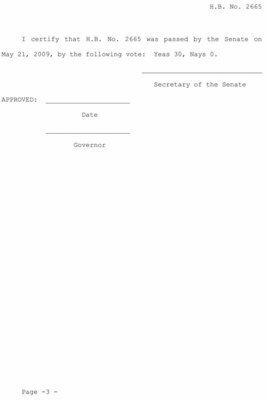 There is a new law that has recently been passed by the Texas Legislature. (See the images.) 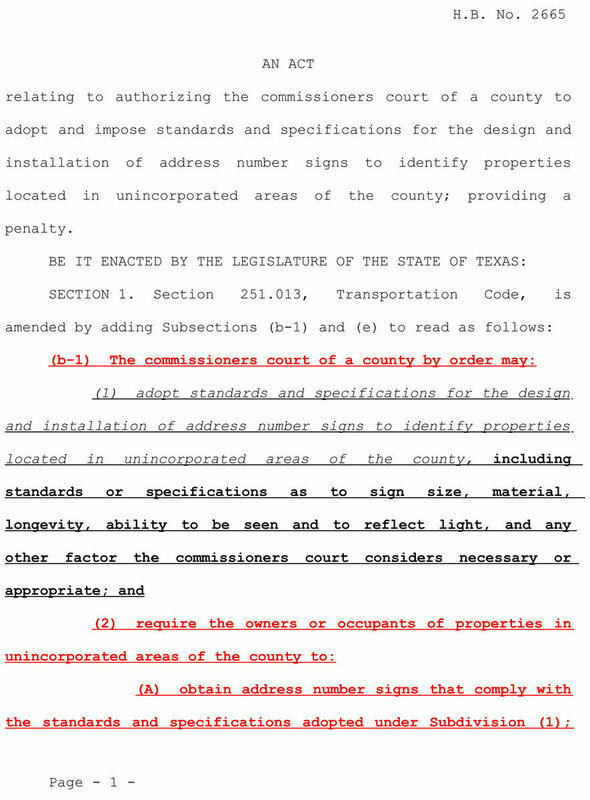 This law is set up to allow any county that wishes to subscribe to it, to force all the home owners in the county to put a regulation size sign on their homes identifying the home. At first brush this looks like a tremendous asset, especially if you are a fire fighter or a policeman because they will be more easily able to identify the location of the homes and certainly that is a good thing. The part that I don’t like about this law is the mandatory nature. It seems to me that our government is getting more and more into our lives. We are loosing our freedom to choose. If you don’t put up the sign this gives the county the right to put up the sign and charge you for it. It again is another encroachment on the freedom that we as citizens have. One of the things I like about Texas is the freedoms. Freedoms from government intervention in our lives. In my opinion Texas is one of the most free states in the United States and I would sure like to keep it kept that way. 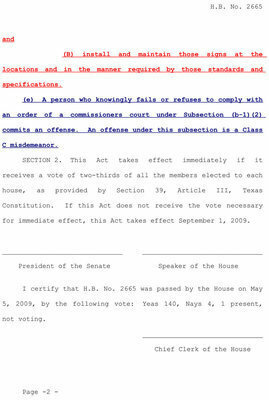 Know that on Monday (10/26/09) the Commissioners court for Ellis County will take up this law as a discussion. It is my understanding that they will not vote on it that day but it will be discussed and I am sure that it will most likely be decided upon. Most of the time our commissioners hear very little from the citizens. The citizens are busy and they don’t take time. However, the citizens need to be more involved or they are going to see more of this type of mandate. In talking with Commissioner Heath Sims, he says the same thing, that he really likes the philosophy but he really does not like the loss of freedom. He does not like more rules. I would like to suggest if you have any thoughts on this that you send those thoughts to one or all of the county commissioners and make a copy to Neotrib as well (editor@italyneotribune.com). Please be pro-Active on this.